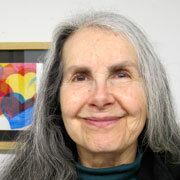 As in the painting above, many of the paintings in the "Narrative Landscapes of the Heart" series incorporate a line of symbols. I think of these symbols as landmarks along the life journey, indicating significant phases in the person's life. These phases often involve external events, but the symbols are more about the internal life -- especially, what's happening in the heart. When I mark out the life journey on a specific painting, I do it spontaneously, intuitively. I paint the symbols from left to right -- birth to death or to the current phase of life. Some people call the cross symbol -- which was a significant symbol long before Jesus was born -- the "plus sign." I love the layers of meaning that each symbol offers. "Flow" - Oil pastel painting #120019 © 2009 Catherine Jo Morgan, 4 by 10 inches, in archival mat 8 by 16 inches. 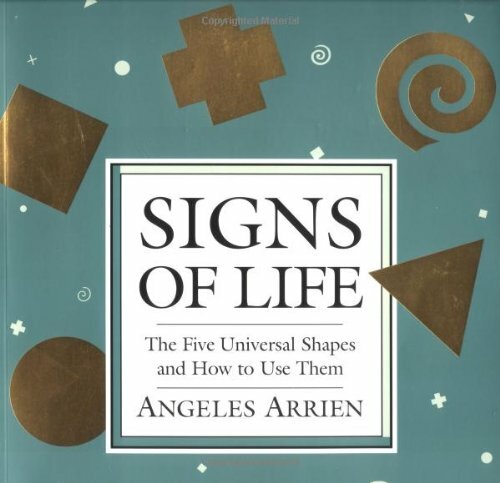 "Signs of Life: The Five Universal Shapes and How to Use Them"
In a 1992 talk in Philadelphia, Angeles Arrien is quoted on spirituality, creativity and intuition: “"Some people think they're not creative, but they want to follow the spiritual path, and if they're on the spiritual path, they end up discovering their creativity," Arrien said. "Other people who think they're not creative at all and not spiritual at all, they end up trusting their intuition. It's really all the same process. It's the deepest process of our nature that needs to be attended to." This is exactly how I began learning blacksmithing. I was on the "personal growth path," designing and leading groups on deep listening, self-esteem, vocational development, assertiveness training, natural cycles etc. I noticed that as a group progressed over several weeks, the participants often became actively creative -- taking up craft and art mediums they'd not made time for earlier. I began to envy my own group participants! My cure, of course, was to take up a craft of my own, and it turned out to be forging iron. One of my openwork iron bowls, "This Wild Garden of My Heart" has a heart-shaped base and uses the spiral shape a lot. She has does conflict resolution work all per the world. The interview includes many more interesting bits of Angels Arrien's own story. Most of the interview, though, is aimed at evoking our own creativity and contributions to the world. As always, Arrien challenges and encourages us. Read the whole interview, and at the end you’ll find a simple yet wonderful exercise to open up this period of your life. That will be number 2 in a series of five articles here on the Five Universal Shapes and Angeles Arrien's work in relation to art, health and spirituality. I hope you'll want to enjoy more articles. Enter your email address below to subscribe to this blog by email. Of course I won't sell or share your email address, and you can unsubscribe at any time. Your comments and questions are so welcome here!